Fresh off its purchase of the largest bike-share operator in the US, Lyft says it’s adding incentives and discounts to encourage more people to use bikes and scooters, especially to and from mass transit hubs. The goal is to get more people to abandon their personal cars in favor of mobility services owned and operated by the ride-sharing company. Earlier this month, Lyft acquired Motivate, which runs Citi Bike in New York City and Ford’s GoBike program in San Francisco, for a reported $250 million. Since then, the company has been working to integrate bikes and scooters into its platform “from the ground up,” Lyft’s co-founders said in a Medium post Monday. Much of Lyft’s plan is outlined in its permit to operate bikes and scooters in San Francisco, which was submitted last month. The company says it is considering “up to 100 [percent] discount on rides that start or end at designated transit stops such as MUNI, BART, or CalTrain.” Today’s announcement is an indication that Lyft is considering expanding those discounts to other markets with bike and scooter sharing programs as well. investing in electric scooter startup Lime, as well as integrating Lime’s scooters onto its app for rental to users. Soon after, it was reported that Lyft is in active talks with another scooter startup, Spin, about adding electric two-wheelers to its ride-sharing app. 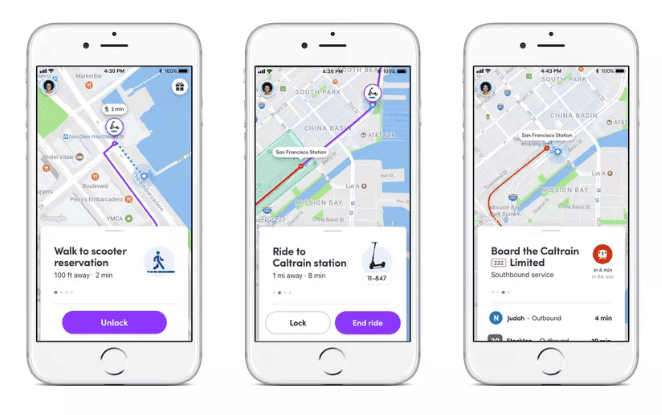 Lyft also recently unveiled its first app redesign in three years, emphasizing shared rides and public transportation. Lyft says it will also invest $1 million on projects designed to expand public transportation into underserved communities. The company says it will work alongside local nonprofits and community groups across the country like TransForm. Some recent studies indicate that the rise in ride-sharing apps like Uber and Lyft has had a net negative effect on mass transit. And the emerging consensus among experts is that ride-hailing is worsening traffic congestion. A study by the Boston-based Metropolitan Area Planning Council found 42 percent of trips taken via ride-hailing services in Boston would have been completed on public transit had the option not been available. Another 12 percent of people would have walked or biked. Plus, most people use ride-hailers end-to-end, rather than mixing the service with other modes of transport.